Be the first to share your favorite memory, photo or story of Pamala. This memorial page is dedicated for family, friends and future generations to celebrate the life of their loved one. 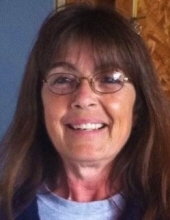 Pamala “Pam” Gasper, age 61, of Tomahawk, WI, passed away on Friday, April 5, 2019. Pam was born August 18, 1957, in Milwaukee, WI, to the late Wenzel and Sandra (Sorkan) Schutt. She grew up in Greendale, WI, and graduated from Greendale High School. Pam moved to Tomahawk to be closer to her family in 2013 after working for Kohl’s Corporate in Menomonee Falls, WI, for 34 years. She enjoyed spending time with her family, watching her grandchildren waterski, fishing, dancing, and talking to and watching all the wildlife that came into her yard. Her Siblings, Susan Wieland, Steve (Laurie) Arneson, Al (Beck) Arneson, and Blayne Arneson. Pam is further survived by other Aunts, Uncles, Nieces, Nephews and Cousins. She was preceded in death by her late Husband, Michael Gasper; her Parents, Wenzel (Marilyn) Schutt, Sandra (Jon) Winter; her Sister, Jan Ische; a Niece, Sandra Rogers; and a Brother-in-Law, David Wieland. A Celebration of Life Service for Pam Gasper will be held on Friday, April 12, 2019, at 5:00 PM, at Generations Funeral Home. Pastor Larry Mathein will officiate. Pam’s family will receive friends for Visitation from 2:00 PM until the time of Services at 5:00 PM. To send flowers or a remembrance gift to the family of Pamala A. Gasper, please visit our Tribute Store. "Email Address" would like to share the life celebration of Pamala A. Gasper. Click on the "link" to go to share a favorite memory or leave a condolence message for the family.